Your reference au pair agency in Belgium. Looking for a caring and responsible AU PAIR? AU PAIR Belgium is an au pair placing agency that has been active for more than 10 years in the selection, recruitment and placement of au pairs in Belgian host families. Our mission is to select and place the au pair who fully meets your expectations. Your confidence in the au pair who will take care of your children, is essential. First, we will determine together your expectations vis-à-vis your future au pair in detail. Then, AU PAIR Belgium will assist you in the selection and recruitment of the ideal candidate for your family and guide you through the processing of the papers. In a nutshell, we take care of everything : both before the arrival of the au pair in your family and during her stay in your family. You would like to be au pair in a Belgian host family? You are between 18 and 26 years old and wish to stay for a year in Belgium. You look forward to discover a new culture and wish to improve your language skills. You like children, to take care of them and participate in their education. You are willing to have some light household chores. AU PAIR Belgium offers you the opportunity to discover another culture while living in a nice and caring host family. We also organize events for our au pairs where you can meet other au pairs from different nationalities. Why choose AU PAIR Belgium? The heart of our mission is to ensure that the cultural exchange is succesful ant that this experience is enriching for both the host family and the au pair. Hereto, AU PAIR Belgium selects and recruits caring and responsible au pairs and verifies if the au pair and the host family have the right motivation. Furthermore, we accurately follow-up on the placement process in order to welcome the au pair as soon as possible in his/her host family and to guarantee that the au pair’s stay is legal. 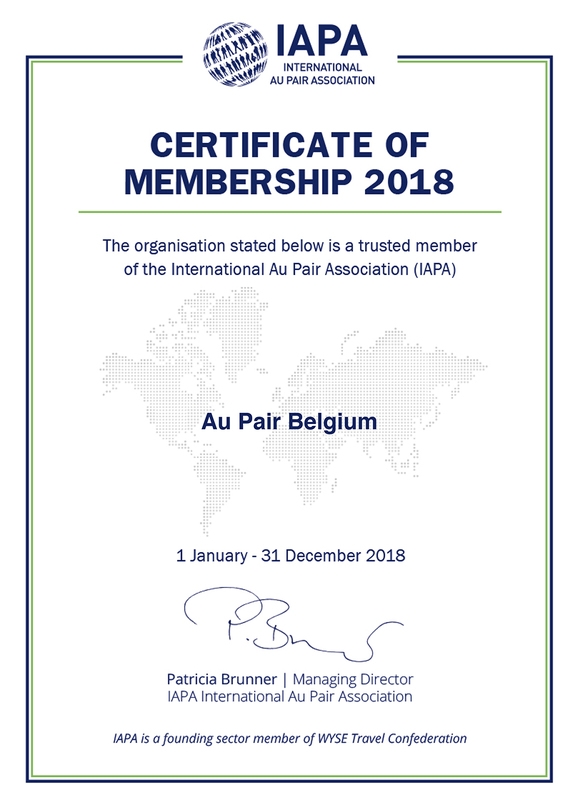 AU PAIR belgium is a trusted member of the International Au Pair Association (IAPA) and fully respects IAPA’s Code of Conduct for au pair associations.